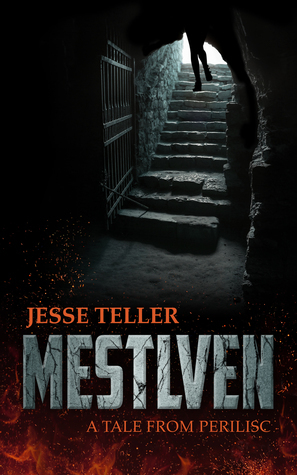 Mestlven is the latest book in the Tales from Perilisc series by Jesse Teller. I found this to be the best book yet by Teller. The last novel Chaste left many characters in turmoil. This time Teller takes us to the city of Mestlven. Here we learn about Sob and her past. We learn about her obsession with stealing jewels and how she became the deadly assassin that she is. We also discover just how troubled and deep her instability runs and why she became this way. Joining her in this novel from the past is Emily, the young girl in Chaste that she saved and took under her wing, and Sai the swordsman that was her friend and companion on their last adventure. In this story, though, Sai is no longer her friend but an unfortunate enemy that she shares an understanding with. Teller introduces several new characters that the story line focuses on as well, Mort, the priestess of the Pale, Saykobar, a wizard of immense power, and Donnie the Ego, the young man that runs a mass crime ring. Together their destinies intertwine and we see the full savage and cruel world that Perilisc is, where modern decencies are nowhere to be found and suffering is common place no matter what your station in life is. Mestlven is the town Sob is from, the castle Sorrow Watch, was her home when she went by the name Meredith and was married to Malcolm. She was content in that life, even though her true love Stephan, Malcolm’s brother, was dead. Malcolm loved Meredith and together they had a child, a girl named Megan. This is the baby she always referred to in Chaste. Her life however was destroyed when a group came and murdered her child and Malcolm. This set her insanity into full swing and a series of events that followed lead her to become the deadly assassin she is. Sob returns to Mestlven to exact her revenge on the people that ruined her life. The town of Mestlven is a haven for the depraved, dirty, greedy and perverted. Their perversions know no bounds and Sob means to rid the town of those that soil her home. She shows no mercy to those that made her this person. The goddess of death, The Pale, sends Mort into Mestlven to assist Sob in getting her vengeance. The Pale works in gross and morbid ways, such as taking a disease from one and then sending to another that the Pale wants to inflict pain and suffering on. Mort has the skills to do the bidding of the Pale and her works coincides with Sob’s. Mestlven is a well composed story line with dynamic characters. Jesse Teller is able to bring their minds to life, their personalities are deep and complex. Sob’s story is heartbreaking and despite her clear insanity the reader can’t help but feel great compassion for her and want to see her achieve her goal of vengeance. So many of the other characters are not what they seem from beginning to end. You’ll end up loving characters your supposed to hate, and characters you trust will betray you. I won’t say that there is a happy ending, but sometimes you settle for just having peace. Teller has composed another great novel and I look forward to reading where the story line of Perilisc will go next.